Super Smash Bros., a franchise which started on the Nintendo 64 in 1999, is the culmination of creativity, technical prowess, and a surplus of creativity. From the characters, to the items, to the modes, and to the stages, Nintendo continues to deliver generation after generation, a game which helps define the gaming generation. One of the most variety-filled aspects to the series has always been the different stages based off the various game franchises found deep within Super Smash Bros. With so many options it's easy for someone to find a favorite but that favorite will certainly vary from gamer to gamer. Thus I took it upon myself to set up this Super Smash Bros. 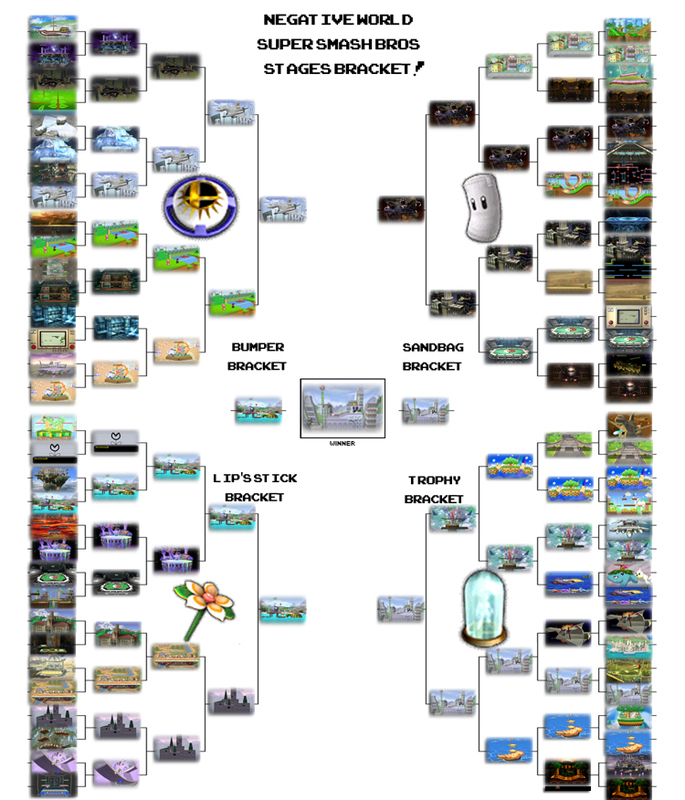 Stages bracket to find out what the culmination of those opinions were and find out which level would be picked by Negative World as the very best in the series up to this point. The 3DS and Wii U stages are pretty awesome yet they were excluded partially because when we started all this the 3DS game had just released and there wasn't enough experience out there to throw their hat into the ring. Perhaps down the line we'll try this again with additional stages and thus additional rounds. For now though, we have a reining champion to announce (and much much more)! Here are the results of this month-long endeavor to find out which stage is the Negative World favorite! SAFFRON CITY in Super Smash Bros. 64! Saffron City is a stage found only in Super Smash Bros. 64 and is based off the city of the same name from Pokemon Red and Blue. In it's source game the city is designed after the hustling and bustling city of Tokyo and acts as sort of a hub between different cities in the game. 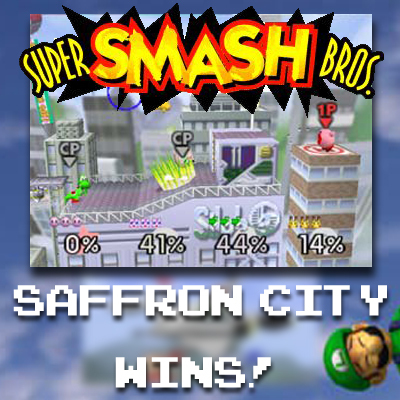 For the fans at Negative World, perhaps Saffron City acts as a hub between gamers! At the center of this city is Silph Co. which just so happens to be what you fight on top of in the stage. The stage consists of a central rooftop with some floating platforms to the left and another building to the right but separated by a gap. This varied yet clear layout surely helps explain the love for the stage. In the Silph Co. rooftop a portion is raised with something like a garage door. Occasionally Pokemon will pop their excited little heads out of it! Chansey will toss an egg which may contain an item as well as heal the players. Unfortunately it can be KOd! Charmander also appears and he may or may not breath flames. Regardless he'll definitely make a funny noise. Electrode will show up just to explode and cause major damage while Porygon will quickly surprise the fighters and mocking them. Venusaur is the last Pokemon who can appear and will shoot out leaves via Razor Leaf. Pokemon aren't just limited to the door though as you'll see flying Pokemon such as Fearow, Butterfree, Pidgey, and even possibly Moltres flying in the background. 1.) If Corneria had beaten Great Bay… Saffron City STILL would have won, deeming it the Negative World Super Smash Bros. Stage Favorite!!! 2.) Of two similar and random stages, PictoChat beats out WarioWare Inc! 3.) My two favorite stages in the series just might be Smashville and Pirate Ship. I felt that both were voted off too soon and deserved more respect! I was curious as to which was preferred though and I found that Pirate Ship certainly is! 4.) Of the two Earthbound stages Fourside had made it farther through… but it turns out Onett is vastly preferred. Since Onett lost to Brinstar Depths, had it made it through these two stages would have went head to head and Onett would have in fact made it to the final four! On a personal note from myself, DrFinkelstein, I want to thank everyone who voted during this special month-long journey into the Super Smash Bros. stages. It's been a lot of fun and made me dig a bit deeper into why I cared for, or didn't care for, various stages and features of the Super Smash Bros. franchise. Like all Super Smash Bros. games, this final article has a bit of a stat fetish. Below are various stats relating to the action of participating in this feature. Who Voted The Most: Jargon, nate38, Zero, ploot, chrisbg99, and Mop It Up voted fifteen times... thus every time! Thanks! Who Had the Most "Perfect Votes": Ploot and TheBigG753 had seven rounds of perfection! I can honestly say I would have never in a million years predicted this one to be the winner. What would you have thought would have won in the end? Or what would you have hoped would have been the winner in your mind? Predicted? Tough to say really. Something a bit more dynamic maybe? The Metroid one that made the final four. Some Pokemon stadium perhaps, since everyone loves Pokemon and those are really dynamic. Pirate Ship because well, it is Wind Waker and awesome. Something like that. And I didn't expect an N64 stage to win period, since my impression was always that most people really started getting into Smash with Melee. Keep in mind I mean "if you had asked me at the start of this..." After a certain point I began to realize that what I thought would be the more popular stages were not. As for hoped well... you'll have to wait for my top 10 for that one. Saffron City is possibly my favourite N64 stage, and it's still no slouch in Brawl's Project M, although it's missing the awesome Pokemon spawns. Goes to show the level layout is interesting enough to be totally fun. I'd love for an official remake of the stage, with even more "door Pokemon." Also, hooray for my perfect votes! Back in college, whenever Porygon popped out, my friends and I always thought it sounded like it shouted "CRACKHEAD!" It was hilarious to us, and is probably the reason I voted for the stage. I voted the most! Take THAT, everyone else who didn't vote the most! Nice job with the bracket. Clearly, -I- have the best taste when it comes to Smash Bros. stages. That's funny... and I can totally relate. Whenever Charmander would pop out, it always sounded like "GUMMYBEAR" to me. And of course, I would have to repeat it in the same tone whenever it happened. I still do to this day (when around those that know of it). And this is actually the reason, and the only reason, I voted for this stage. But, the real winner of this Bracket thingy is Onett, Fourside, and New Pork City. A three way tie. I know this to be true despite the results. You all are just being silly. This was a pretty amazing effort on DocFink's part and this end result really shows it. Well done, Doc! No. No in every single way possible. New Pork City might actually be great with 8-player smash now!... but it would have to be limited to only that many players. It's still pretty horrid for less than that. Thank you Joe! I had a lot of fun managing it and making graphics up and all that jazz. I would be down for that re-make as well, though I wonder if we'd ever see it with the inclusion of Pokeballs now. I guess it wouldn't matter either way. Sorry for not voting more. I browse a lot on my phone these days and it's kind of a pain to vote in things that aren't just polls. Sorry to not see Hyrule Temple at the top. I feel like it's big. But usually the action gets quarantined to a certain area. Love duking it out in the underground part. I like Corneria but it's just too small. You basically nudge someone and they get taken right off the top. Why is the Great Fox so small anyway?? Great Bay is fun thematically but I think makes for a pretty terrible level. Again, I feel like it's just too small. And by that I mean I think the "sweet spot" for KOing people is too tiny. I personally like the levels that have a little variety but not so much that I feel like I'm getting killed randomly. Brinstar is fun in Melee. Norfair in Brawl? What a mess! I also can't stand levels that aren't floating islands. I like the SubCon level in Melee but can't stand the fact that you can walk off the edge. I think every one of those levels should be ouuuut. I love the Kirby levels from the first two games. Love me some Fountain of Dreams. I think that one is small but it might get my nod for all time best Smash level. It's epic and not annoying at the same time. Win win. I'm happy with this result. Saffron City is the most memorable level from the original game and I'm perfectly happy with a classic taking the throne. Nice job putting this together, Fink! I'll have to think about doing another one in March if I can come up with a good idea. Hell, if you feel like it, make your missed votes now! I'm curious how they would have aligned with the end results. Thanks for sharing a breakdown in your post already like you did. As much as I champion Great Bay, you may be right about it not having enough fighting space. As I play more and more with no items and 3 stock like I have been with the tournament and practice, I find that I prefer the Omega versions of levels more and more. Once the tourney is over I'll probably branch back out to randomness that I love. I think as far as the franchises go, Kirby might be the most consistently great set of levels. In fact, that seems to be the case still going into the Wii U version. Thanks Jargon! and thanks for doing that one back in March. It was fun and inspired me to do this. Maybe you can do a Spring version and I can do a Fall version and we'll just keep looking into the favorites of various topics on the site. Your original idea was probably the ultimate one and mine really made sense for the time of both the release of the games and the place these games sit within the franchise. Perhaps your next one could focus on a singular console? Omitting the obvious ones even (or keeping them in). Pish posh. Well, I suppose for super serious players this stage isn't the best. But for players that like to have fun, this one is the bee's knees. And, I mean, where else in the game can one hear the glorious song, Snowman? Not to mention being able to take a ride on a flying limo and dodge a chomping Chimera! I doubt the stage will return in the Wii U version. Actually, I know it won't return, but it'd be cool, though, if it was one of bigger stages to be used for 8-player Smash. It would make for some chaotically fun matches. While I'm kind of done with the 3DS version, I found/find myself playing the Omega versions more and more as well. They just work so much better on the small screen - as when the camera pans out when the players separate, it's kind of hard to see who's who. Well, not really, but so much detail is lost. Plus, some of the hazards and gimmicks can get a bit annoying. And yes, to echo the words of others, kudos to the good doctor for putting this all together. I didn't vote as much as others, as I lose interest when I see the tide changing for the worse. But, it was fun to see how it all played out. I didn't vote as much as others, as I lose interest when I see the tide changing for the worse. But, it was fun to see how it all played out. I was afraid some would feel that way. To me, when the tides are turning, your votes matter even more! On that side note, go out and vote in the mid-term elections on Tuesday! They matter too!